Apart from the buses and subway system in Sapporo. There is also the Sapporo Streetcar. The Sapporo Streetcar runs in what almost looks like an L-shaped loop, but the loop is incomplete at one end. So the two termini of the line are literally two blocks apart from each other. These two end stops both start in the busy Susukino district of Sapporo. Susukino is Sapporo’s entertainment district. It’s home to a whole whack of restaurants, host/hostess clubs, and other businesses of the night. 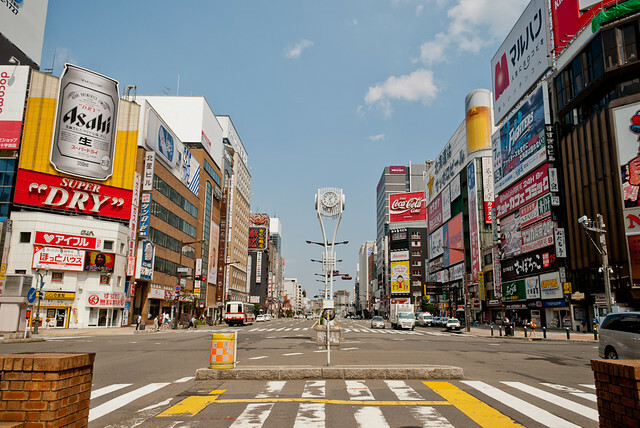 Susukino is where you will also find the largest collection of neon billboards and adverts in town. This area really shines through at night. The next morning, we hit up the Morning Market near Hakodate Station. This is basically a seafood market that lies directly south of the Hakodate Station. During most of the day, this market is quiet. 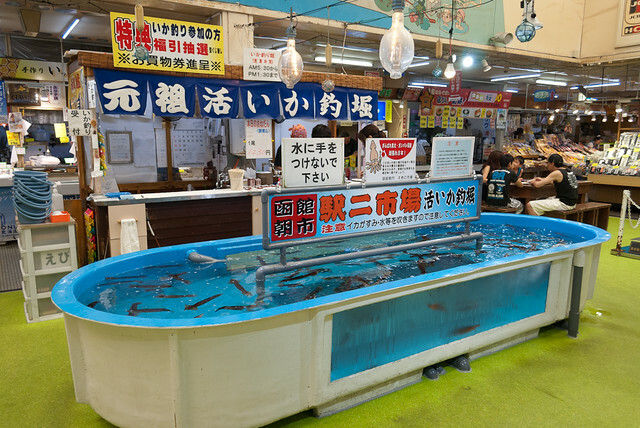 However, in the morning, the stalls are open for business for you to try out the freshest in seafood that Hakodate has to offer. The freshest seafood also comes at a bit of price. The fresh cuttlefish that you can fish out on your own can cost about ¥1300 depending on what the market price is that day. It’s not the cheapest, but I guess it’s a fun experience. However, it is a fun experience we ended up passing on. Hong Kong Island is one very hilly place. Most visitors and tourists would only venture up the hillside to visit The Peak. 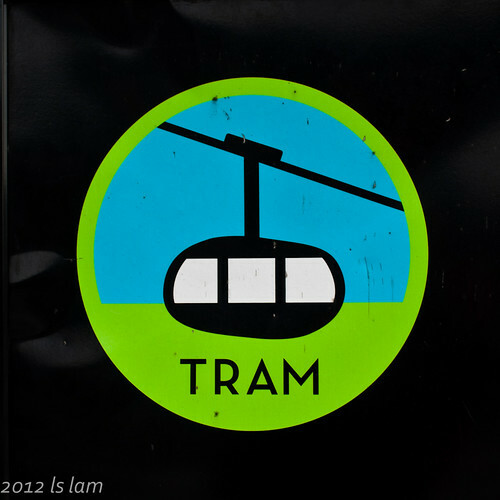 Even then, most people would likely take The Peak Tram (which in itself is a tourist attraction). If you have an extended period of time, then it may be worthwhile to explore off the beaten path into non-touristy Hong Kong. On this January Sunday, I was meeting up with an old high school classmate. I don’t think I had seen him since my university days in Vancouver. So it was a great chance to meet up with him and his wife. We had set a time to meet at the Starbucks at Park Road and Bonham Road. Okay. I’ve heard these street names, but I had no idea where it was. Thank goodness for Nokia Maps and their downloadable city maps. 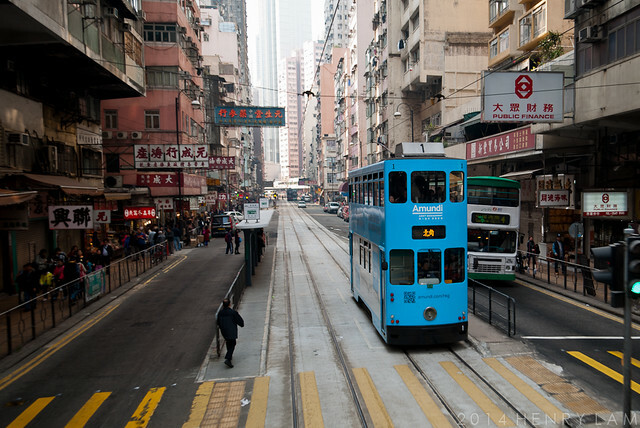 On my map, I found the intersection and ran a straight line down from there to the tram line along Des Voeux Road. It happened to follow along a street called Eastern Street. This street would be the subject of my pre-meeting exploration. It looks like another piece of Vancouver history is disappearing. It’s unfortunate that the city is no longer going to support this fine piece of Vancouver history. I was fortunate enough to have ridden the streetcar a couple of years ago. It was a nice, idyllic ride from Olympic Village station to Granville Island. It was really the best way to reach Granville Island without a car. After a quick fix of caffeine and WiFi (plus a chance to rest our feet) at my uncle’s place in Sheung Wan, we were back out on the street. It was Sunday, so my uncle took us down to a weekly market that closes some streets in the area. There were some performances on a stage and a lot of ladies lining up for some freebies at one tent. Attention train/transportation/transit fans: There’s a great streetcar ride available in Edmonton, Alberta. Coming from Vancouver, I have enjoyed our own local historic streetcar. 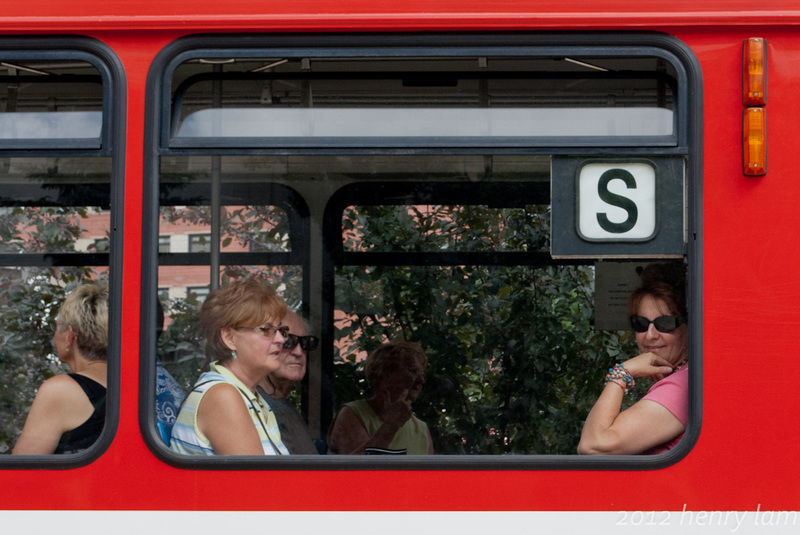 Unfortunately for 2012, the Transit Museum Society didn’t run the streetcar. 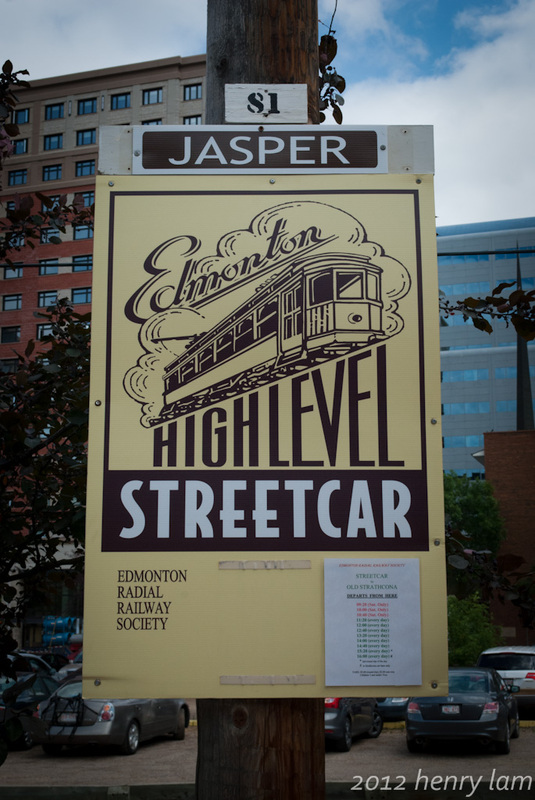 However, the Edmonton Radial Railway Society seems to be fairly robust with at least 3 streetcars in their rolling stock and trams that run daily during the summer. First off, we had to find where to get the streetcar. Many websites and reviews that I read gave general directions, but I wasn’t entirely clear on the exact location. So to find the actual starting point, I had to weave my way around the Old Strathcona Farmers Market to find the almost unremarkable loading platform. The Dropped Pin above marks the exact spot. 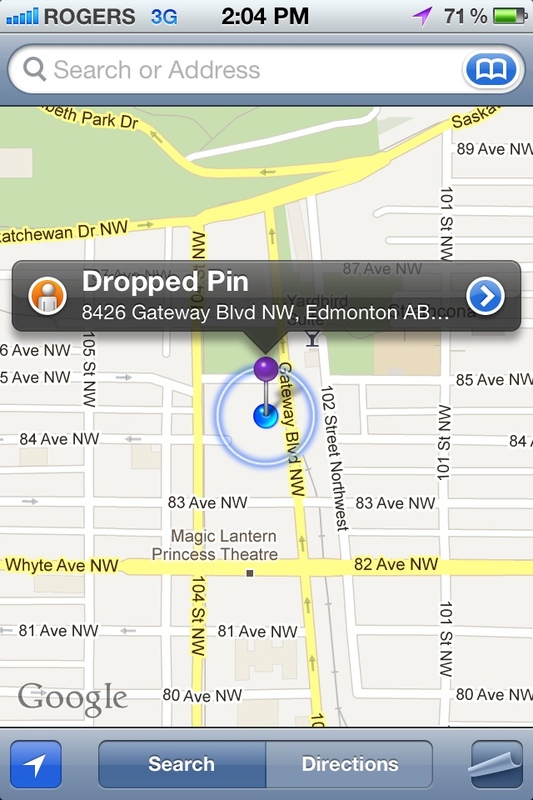 I came off of 104 St SW to find the stop, but it might be easier to walk up Gateway Boulevard to the stop. I was expecting a classic old-timer streetcar, so I was surprised when I saw this modern Siemens tram roll its way towards the platform. The Siemens car, known as Hannover #601, dates back to the 1970’s. So that makes the car 40 years old. I guess it qualifies for a heritage rating now. The car was actually originally purchased by the BC government as demonstration streetcar to showcase light rail technology for Vancouver. Eventually, the BC government settled on Bombardier’s automated SkyTrain system and the car was no longer needed. In 1985, the Edmonton Radial Railway Society purchased the vehicle. You can read more about Hannover #601 on the Society’s website. We bought our roundtrip tickets and boarded the tram. 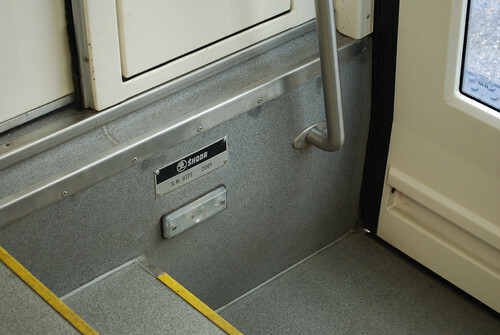 The steps folded down to the platform level to allow passengers to board. There was a wheelchair door, but unfortunately for all the baby strollers, it was out of service. This classic 70’s streetcar isn’t much older than the Siemens U2 light rail cars that serve the Edmonton LRT system, so the seats and interior are quite modern and minimal. It wasn’t the heritage feel I was expecting, but I just arrived on the wrong day for that. The car made its way northwest down the tracks past the north side of Strathcona and the busy Whyte Avenue. The tracks ran through a large swath of green. Sometimes we would pass by a community garden or two. However, it was like an unofficial linear park flanking the rail lines. One of the major draws of this particular streetcar line is that it traverses the very loft High Level Bridge. The bridge towers high above the North Saskatchewan River. In the summer, the bridge can be an artificial waterfall with gallons upon gallons of water spewed off the side. It’s great for celebratory occasions like Canada Day. It’s an outstanding view from the streetcar to see the river valley below. Also, the streetcar tracks actually are above the southbound automobile traffic. So car drivers can see and feel the shadow and rattle of the car as it passes overhead. 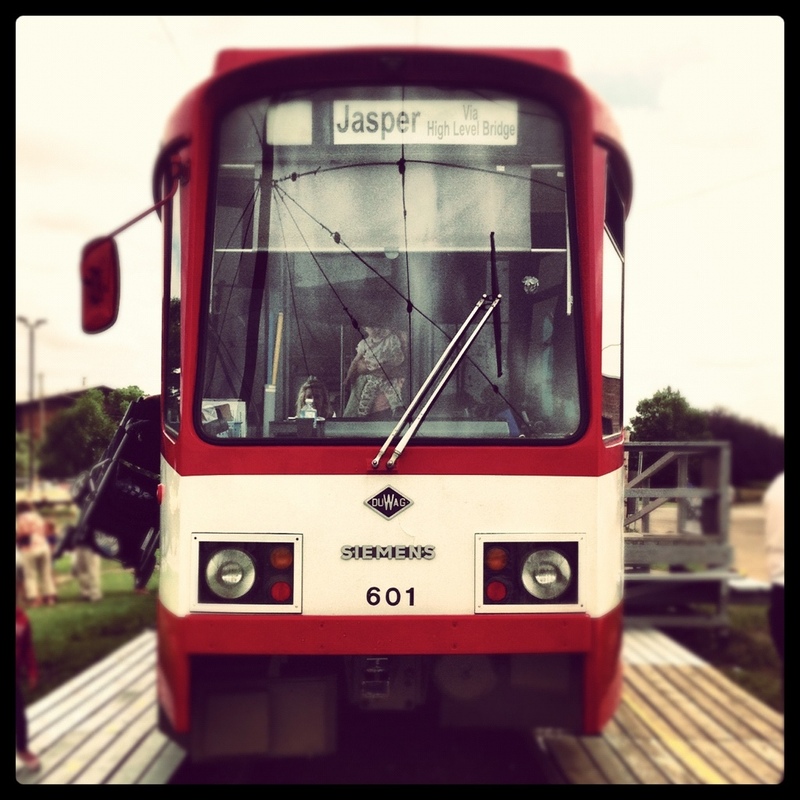 The streetcar’s final stop at Jasper Plaza just half a block south of the busy Jasper Avenue. A lot of the locals would get off because they had planned a one-way trip. I got off the car to take a few photos of passengers waiting to go back over the bridge. 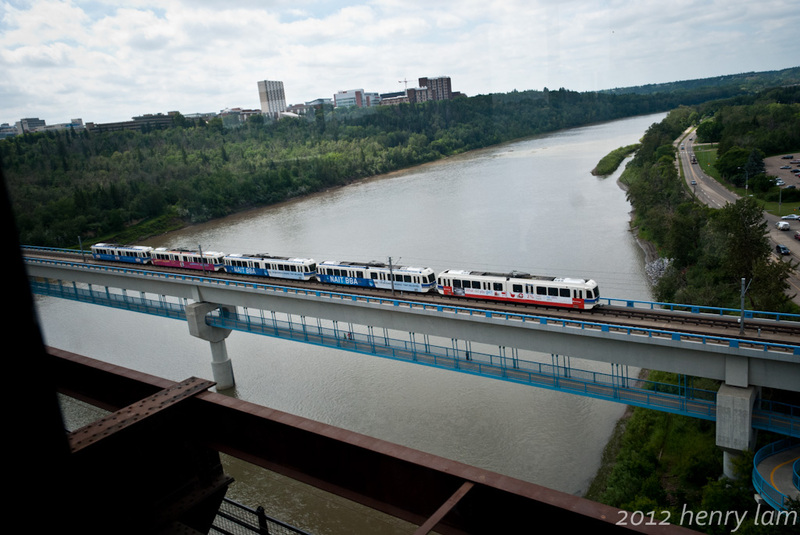 On the way back over the High Level Bridge, I spotted the Edmonton LRT on the LRT bridge crossing below. The five-car Siemens LRT is the actual full-time working rail transit in Edmonton. It was also one of the first LRT systems in North America. The bridge also doubles as a bicycle and pedestrian bridge which can seen just under the LRT. So our round trip took roughly an hour. It was well worth the $5 to take the High Level Bridge ride with the vast and wide river valley view. Check off another transit ride from my bucket list. We spent part of our time in Edmonton along Whyte Avenue in Old Strathcona. I think Whyte Ave is the most truly urban part of Edmonton. Small independent stores, bars and restaurants line the street. There is the odd interjection of car dealerships that disrupts the urban walk, though. 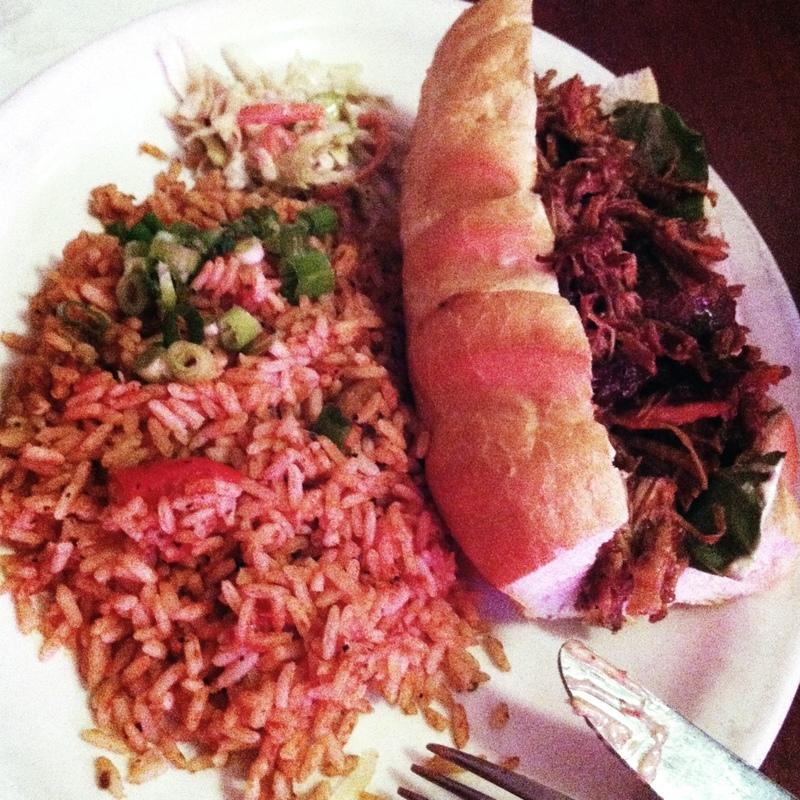 On one night we went to a New Orleans diner on the recommendation of our friend’s coworker. Dadeo was the name. It’s an adult -only restaurant, which I find amusing. There’s nothing adult-rated about the place as far as I can tell. Maybe it has something to do with serving alcohol. 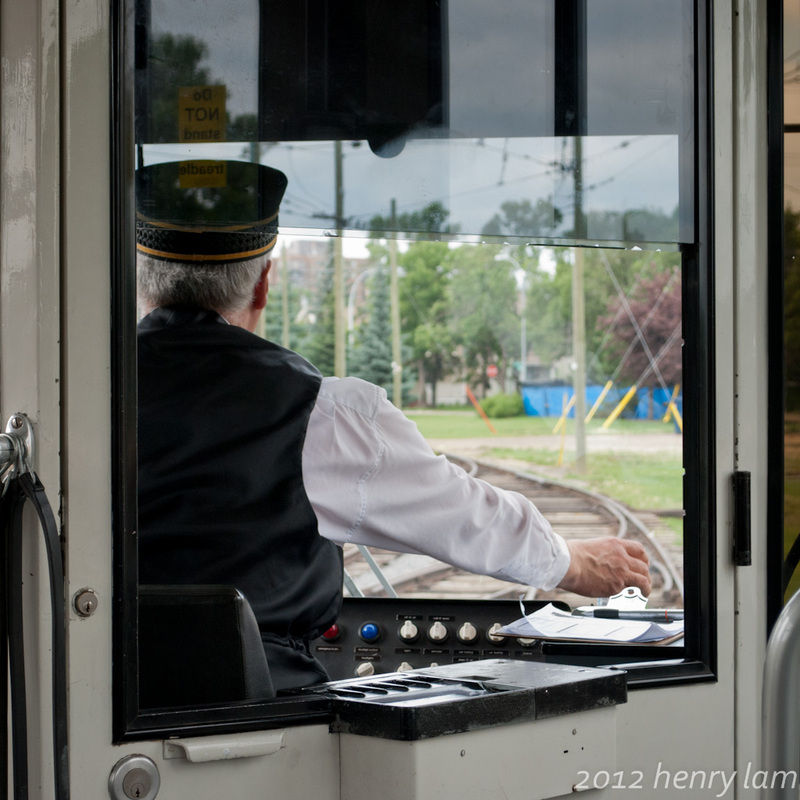 On the following day, the rail geek in me beckoned to ride the Strathcona streetcar. The tram runs from just behind the Old Strathcona Farmers Market across the High Level Bridge to Jasper Avenue (between 109th and 110th Streets). When the tram arrived, I was surprised to see a modern Siemens streetcar. Apparently, this modern tram runs on Tuesdays and Thursdays. The historic trams run on the other days. 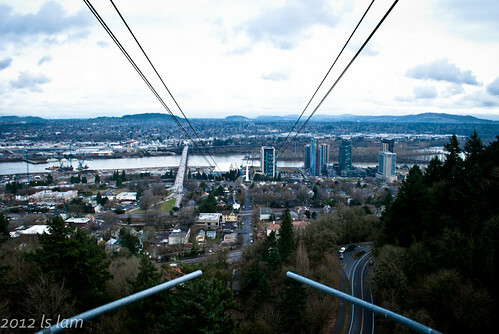 The first time I visited Portland, I arrived at the aerial tram on a statutory holiday. That meant the tram was not running. I even purposely took the streetcar all the way from downtown to ride the aerial tram. So after being disappointed on my first visit to the tram, I was not about to be disappointed this time. However, a funny thing happened on the way to the tram. 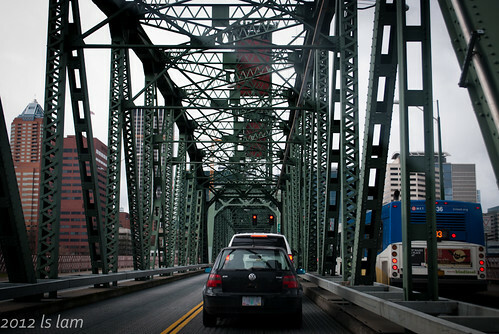 We were heading east along Hawthorne Boulevard and drove right across the Hawthorne Bridge. Sounds simple. However, the Hawthorne Bridge is a drawbridge. Lucky us. We had to wait 10 minutes as a tugboat approached from downstream and had to make its way up the Williamette River. So after this little delay, we drove over to the Portland Aerial Tram. If you are driving from downtown, it’s best to follow the signs that say South Waterfront. 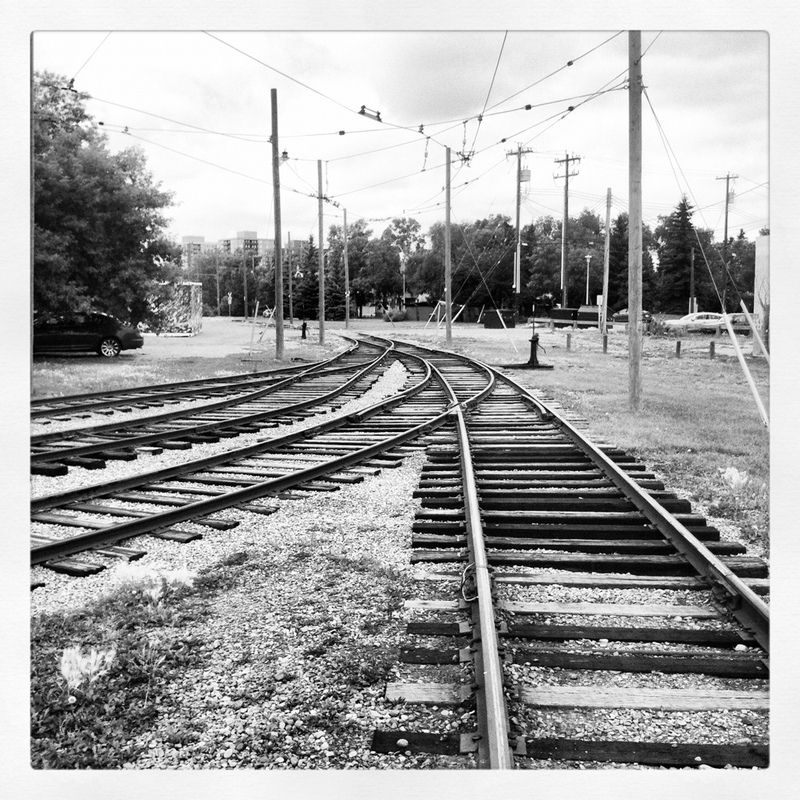 One good sign that you are going in the right direction is that you will be following the streetcar tracks. Keep following the tracks and you will come across the lower station for the aerial tram. We found a lot of on-street paid parking in the area. I paid too much thinking I needed a lot of time to explore, but an hour is more than enough. So don’t overpay. Also, when you collect your ticket/receipt, remember to stick it to the window closest to the sidewalk, not on your dashboard. I remember I had to do this with my parking tickets in downtown Seattle as well. We followed the signs to the tram. The signs are not in great abundance, but you should easily see the tram line hanging high in the sky. Just go to where the line meets the ground. Or if you are taking the streetcar, just get off at the very last stop and you will be right there at the lower tram station. If you are interested, you can also walk around the South Waterfront neighbourhood. 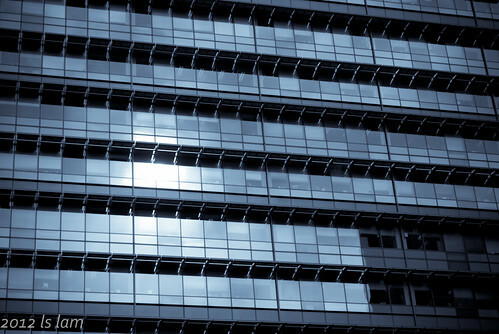 It’s a large steel and glass tower neighbourhood. On the ground, it isn’t all that animated. Perhaps because it’s a new neighbourhood that is separated from most of Portland by Interstate 5. 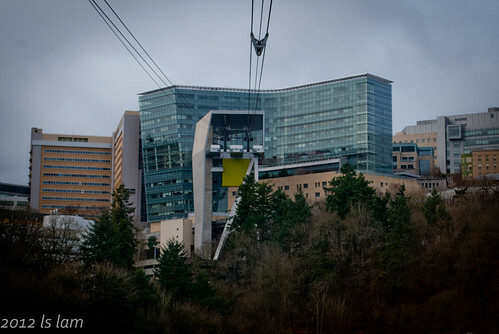 However, the Oregon Health & Sciences University (OHSU) building that is directly beside the tram station is fairly busy on the inside. 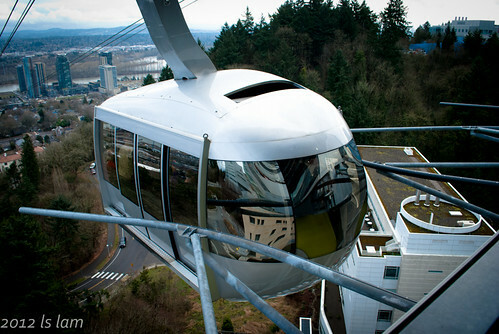 A round trip on the aerial tram is $4 per person. Tickets are dispensed at a ticket vending machine. I thought we would be able to keep the ticket after boarding, but the attendant collected all the tickets. So take a photo of your ticket if you want a little memento of your ride. Or you could pay $4 to keep a ticket for yourself, if you really wanted to. 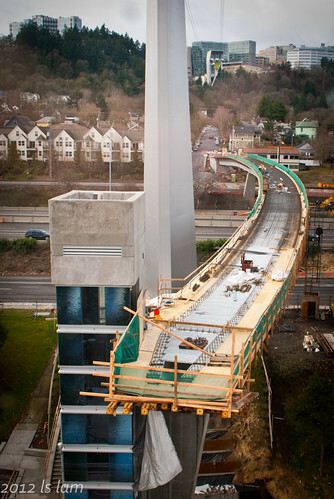 Currently, as you ascend the hill, you quickly see the construction of a pedestrian overpass. I overhear a local explaining to a friend that the overpass is meant to connect the new South Waterfront neighbourhood with the neighbourhood on the other side of I-5. 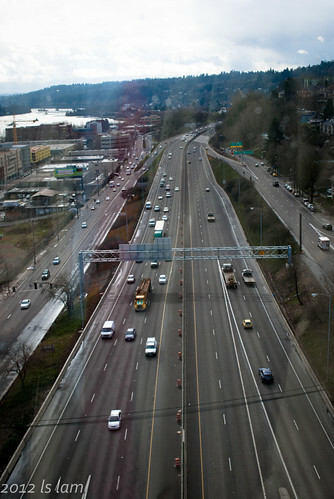 It also gives residents on the other side of I-5 a chance to visit the waterfront without having to drive over. There are only two cars that operate on this short tram ride. As we made our way up the hill, we passed the other one that was making its way down. With the two trams, service is roughly every 10 minutes. An advisory on the website says service slows to a tram every 15 minutes when winds are high. One thing I noticed as we rode the tram is the lack of towers. There’s the two termini on either end and one tower near the lower station. However, it’s completely free hanging from the one tower to the top. That’s a pretty far way to string these giant cables. Also, these aerial trams are very different from other aerial gondola I’ve ridden. I’m used to seeing the small gondolas that carry a few people at a time. Those are the gondolas common at major ski resorts, like Whistler. This gondola can easily carry two dozen people and a few bikes. After using the restrooms, we went back to the tram station. The tram station offers a great view of the city. If it were a clearer day, we could see the mountains further off. Today was very cloudy and rainy at times, so we were just happy to be able to see the city. So we made our way back down on the tram. There are no attendants to collect tickets on the way down. Payment is only ever made on the way up. Apparently, staff and students of OHSU ride for free. Nice perk. 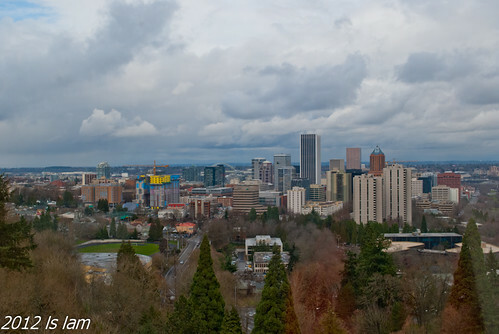 On the way down, I had a clear shot north of downtown Portland. So make sure to keep to the left of the tram if you want a clear view of downtown on the way down. I would stay on the right side if I were heading up. Again, it was a very cloudy day and the grey skies obscured any and all mountains. Back at the bottom at South Waterfront. A streetcar had just arrived and the driver was taking a break. Good time for more transit photography. However, we wouldn’t be taking the streetcar this time around. It was back to our car and off to downtown. There’s been some debate regarding the SFU Gondola plan. Some of the outrage is from residents concerned about effects on their properties. Some are outraged by the fact that TransLink is even considering other transit projects other than the top-prioritiy Evergreen Line. I think Gordon Price puts things in good perspective in his letter to the Burnaby Now. When I first heard about the idea of a gondola to replace that little bit of hell, I was an immediate fan – but skeptical. Would it be cost-effective, practical for students, faculty, staff and the residents of UniverCity – and not an unwarranted intrusion for those who lived below? If there is a good business case – and if TransLink can mitigate privacy concerns for people who live below the proposed path – then the gondola should be built, and quickly. If, on the other hand, a business case fails to demonstrate savings in transit users’ time, in taxpayers’ money and in increasingly hazardous carbon dioxide emissions, the project will likely get bumped down the long list of transit priorities – delayed indefinitely or lost forever in the crowded file of fabulous ideas that didn’t quite work out. 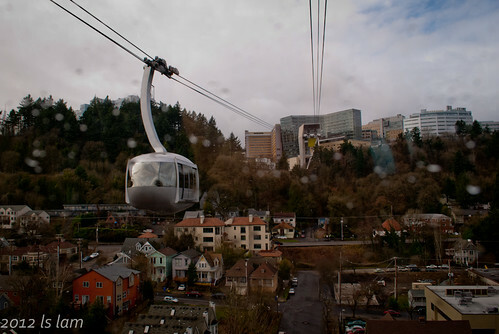 Either way, that’s the basis on which the SFU transit gondola should be judged: on its merits. However, the tram could have a really good potential to save TransLink money in the long run, if it is true that it will help re-allocate buses to other areas. Even though the Evergreen Line does deserve a top-priority status for transit projects in Metro Vancouver, we shouldn’t tie TransLink’s hands from pursuing other potential transit projects. One of the reasons I wanted to go to Portland is their transit system. 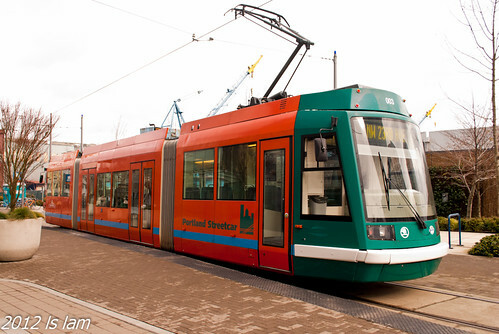 Portland many years back decided to build their system using light rail technology. We, in Vancouver, BC, have never really seen light rail technology unless we’ve travelled to neighbouring Alberta. However, we tend to be SkyTrain snobs here in Vancouver. We’re so used to SkyTrain in Lotus Land. I think it’s good for us to see what a similar sized city in this part of the world is doing differently. 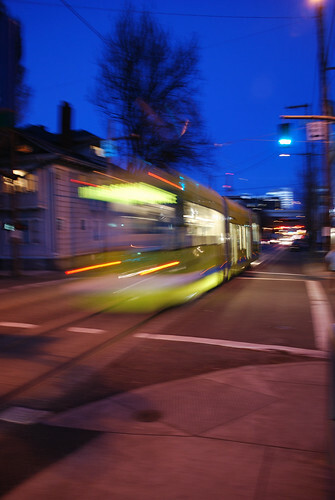 My first experience with transit in Portland was their new Downtown Streetcar service. Although these cars are not fast or high-capacity in any respect, they are definitely a joy to ride in. The cars are longer than a city bus, but a lot narrower than most transit vehicles. As far as I know, there are 10 cars in Portland’s streetcar fleet. 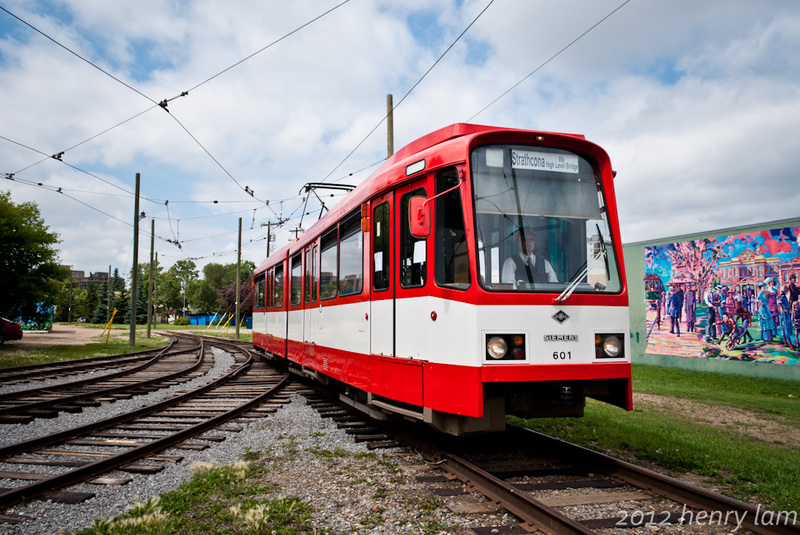 [Correct me if I’m wrong] There is a single antenna that runs up to the electric wire above and has two articulations that allows the streetcar to take tight turns. These particular cars are made by Skoda of the Czech Republic. I might never buy a Skoda automobile, but I really like these trams. 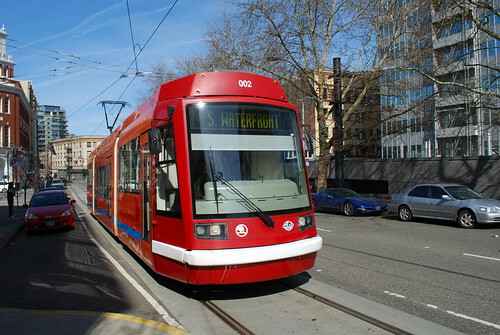 The Portland Streetcar runs in traffic for most of its route. The northbound cars run up 1 one-way street while the southbound cars run down a different one-way street just a block away. It doesn’t interfere with automobile traffic, as far as I can tell. The stops are on the sidewalk and you load onto the streetcar directly from the sidewalk. There is no need to walk into the centre of the road. One of the first things you notice as you board the streetcar is the large fare machine in the middle of the streetcar. 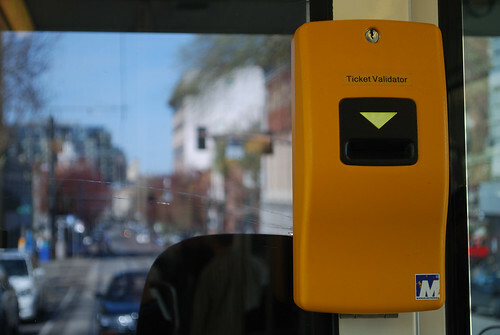 It gives you the options for paying for the basic fares – adult or child – as well as the option to buy your TriMet day pass to use on the whole transit system. The box is rather large and clunky looking and takes up significant space in the middle of the car. 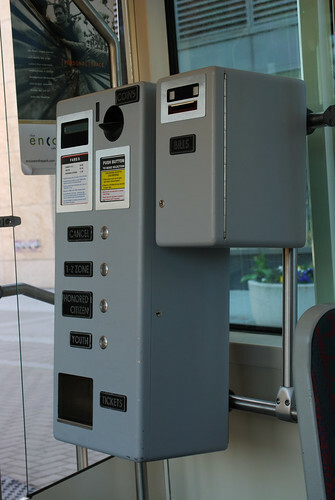 Most of the time, people do not need to use the machine since the majority of the streetcar route runs through Downtown Portland’s Fareless Square. So I didn’t see anyone purchase a ticket while I was on the car. The other thing that the cars have are ticket validators at either end of the car. I guess if you bought a book of tickets, you could validate your ticket to prove that you had paid for ride for the next 90 minutes or so. My only other experience with streetcars has been Toronto’s extensive streetcar system. I can say for sure that Portland’s streetcars are way cleaner and way newer. The width seems about the same, but the length is comparable to the long Queen St Streetcars in TO. These streetcars are also double-ended. So either end can be the front of the car. The ride was also a lot more comfortable and a lot quieter. I didn’t notice the typical steel on steel screech when rounding the corners in this vehicle. It was a very smooth ride, smooth enough to play with an iPod Touch with no consternation. Also, it was smooth enough for me to take pictures without much shake. Another thing I noticed is the amount of development and redevelopment going on around the streetcar. 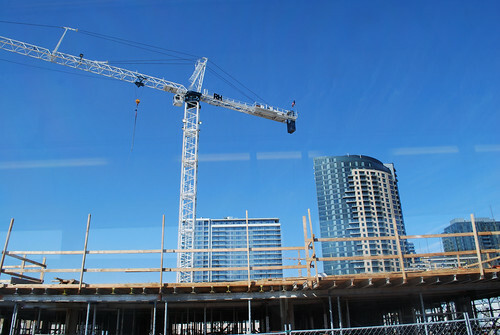 The South Waterfront seems to be reclaimed brownfield industrial sites that are now highrises. 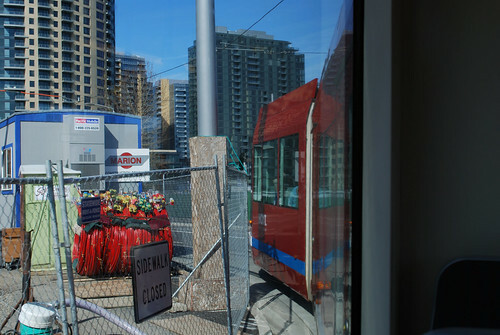 So a whole new neighbourhood is being built around the streetcar in the south. In the north, there is funky Pearl District that is home to many 6 storey lowrises. It seems to be “the place” to live if real estate prices are any indication. Apartments were easily US$800,000. It made me think of Yaletown in Vancouver. There is one issue that I had with the streetcar, though. The streetcars run only every 15 minutes in the evening. In the big picture of transit in North America, that would be considered frequent service. However, 15 minutes is not a big draw for people who do not usually use transit nor do I like waiting close to 15 minutes for the next car. The one evening we took the streetcar to NW 23rd. We got boot off because that particular car was going back to the garage. Fortunately, the signboard at the stop told us that the next streetcar would come in 13 minutes. I was not about to sit in a streetcar stop in an unknown neighbourhood in the evening. 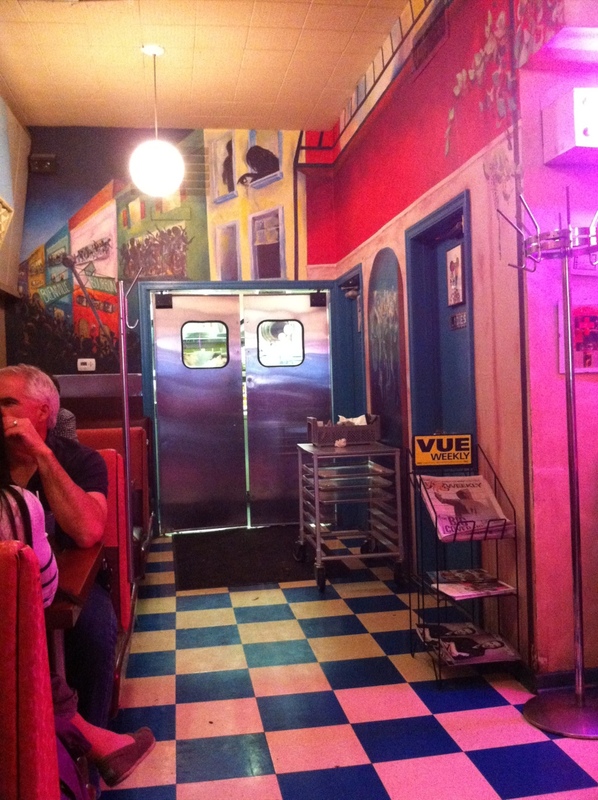 So we walked along the streetcar route until we found a restaurant to eat in. 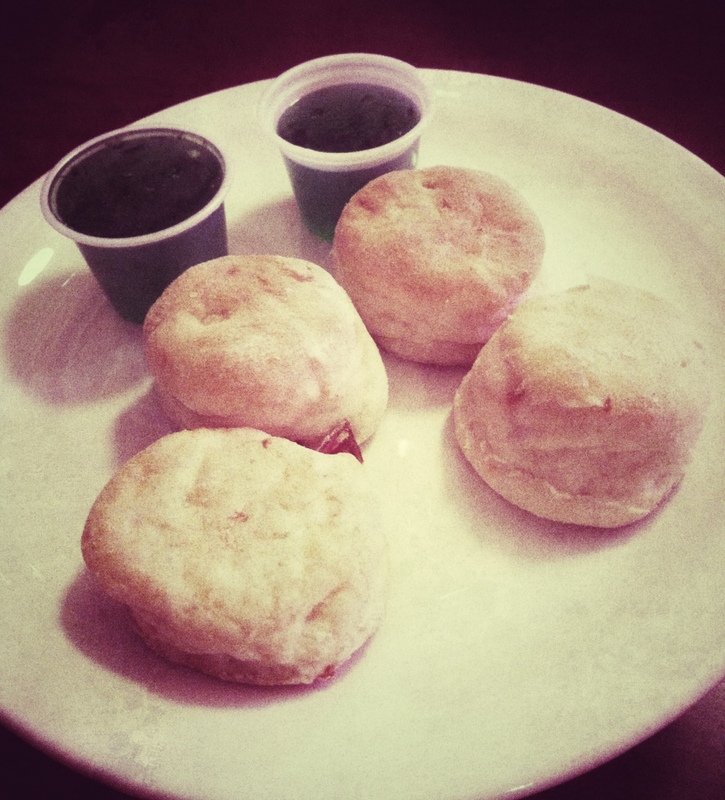 We were starving by this point. Did I mention that a 15 minute frequency is not frequent enough? I think the Portland Streetcar experience overall was a positive one. If we could emulate something similar in Vancouver with the Olympic Streetcar Demonstration Project, then hopefully, more people will be exposed to the great streetcar experience. Now, I didn’t experience the rush hour streetcar, but the midday and evening streetcar rides were both comfortable and pleasurable. We’ll see how Vancouver moves forward with their streetcar plans. The streetcar will definitely add to the Vancouver transit experience. So let’s hope the Olympic Demo moves from Demo to reality.